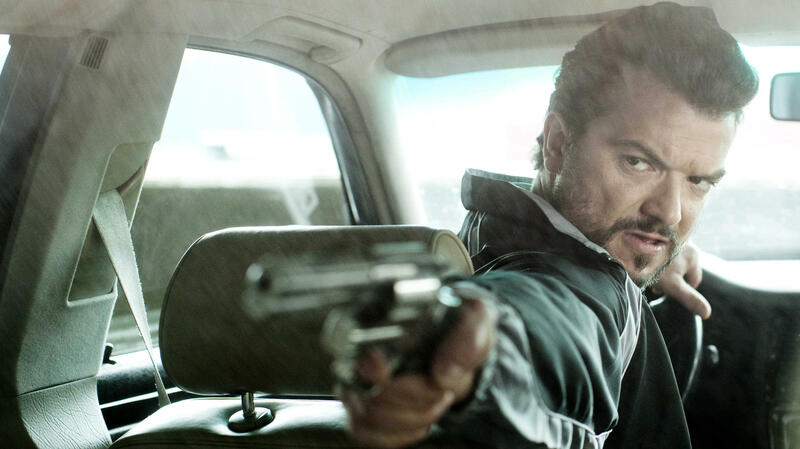 Mrado (Dragomir Mrsic) is the enforcer for a Serbian drug cartel that controls business in Sweden, and one of three characters who clash in Easy Money. Easy Money is a fine title for a film, but to truly savor the tang of this top-drawer Scandinavian thriller, try rolling its original Swedish title off your tongue. Say hello to Snabba Cash. Director Daniel Espinosa starts his splendid crime story all in a rush, throwing us right into the middle of a trio of chaotic situations. Introduced first is Jorge, a Chilean living in Sweden — in fact in a Swedish prison. Making his escape, Jorge promptly goes into hiding, as much from other local bad guys as from the police. Next up is Mrado, a violent enforcer for a ruthless Serbian drug cartel that controls the cocaine traffic in Sweden and is willing to do whatever it takes to stay on top. Though Jorge and Mrado are central to the plot, the film's protagonist is JW, compellingly played by Joel Kinnaman, who went on to star in AMC's The Killing. He's a handsome young man from a poor country family who's smart enough to have gotten a place in Stockholm's top business school. JW wants a lifestyle he can't afford, and when fate offers him a way into the drug trade, he sees no reason to resist. Easy Money succeeds because of Espinosa's impressive filmmaking skills; he's a master at the mechanics of motion-picture action, and he's got a facility for building tension and keeping viewers off balance. He's also got an eye for small details, as well as a gift for psychological complexity. A hit foreign film typically arrives in American theaters as a remake, think "The Girl With The Dragon Tattoo." The hard truth is, Americans don't much care for subtitles. We're going to get a review, now of a top-grossing Swedish film that's now showing in American theaters, in its original form and in Swedish. It helped that the movie and its director, Daniel Espinoza, found fans in Martin Scorsese and Harvey Weinstein - who decided to distribute it. Here's critic Kenneth Turan's review of "Easy Money." KENNETH TURAN: "Easy Money" is a fine title for a film, but to truly feel the tasty flavor of this top drawer Scandinavian thriller, try rolling its original Swedish title off your tongue. Say hello to "Snabba Cash." TURAN: The movie starts with a jailbreak by Jorge, a Chilean living in Sweden. MATIAS VARELA: (as Jorge) (Foreign language spoken) libertad. Libertad. TURAN: Jorge promptly goes into hiding, from other local bad guys as much as from the police. We meet Mrado next, a violent enforcer for a ruthless Serbian drug cartel that controls the cocaine traffic in Sweden, and is willing to do whatever it takes to stay on top. Jorge and Mrado are central to the plot but the action revolves around JW, compelling played by Joel Kinnaman. If he looks familiar to you, it's from AMC's "The Killing." JW is a handsome young man from a poor country family, who's smart enough to have gotten a place in Stockholm's top business school. He wants a lifestyle he can't afford, and when fate offers him a way into the drug trade, he sees no reason to resist. "Easy Money" succeeds because Espinosa's has got the nerve to tell this story all in a rush, to throw us right in the middle of a number of chaotic situations and dare us to look away. As the worlds of Jorge, Mrado and JW collide, recombine and collide again; as JW's understanding of who can be counted on shifts, we're as worried and uncertain as the characters. Only one lesson holds true from start to finish: there is no such thing as easy money. MONTAGNE: And the movie is "Easy Money." Kenneth Turan reviews movies for MORNING EDITON and the Los Angeles Times. If you have a foreign film you'd like to recommend to fellow listeners, answer our call-out on the MORNING EDITION Facebook page. MONTAGNE: You're listening to MORNING EDITION from NPR News. Transcript provided by NPR, Copyright NPR.